* A properly working door in good condition. * 3-1/2" headroom above the highest point of the door for the first 12 feet from the front wall. * 3 prong outlet within 2' of motorhead (a grounded extension cord may be used temporarily until an outlet is installed). 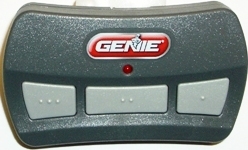 We also have Keypads that will operate other brand openers. Optional VAULT RELEASE If your garage door is operated by a motor driven device that needs electricity and the power goes out, you merely go into the garage and pull the release device to take the opener out of gear. WHAT IF YOU CAN'T GET INTO THE GARAGE? This device (along with your unique key) permits you to release the opener from the outside as long as the door it self is still in good working order. Need an extra or replacement transmitter and found out the model and frequency you need is no longer made? This replacement radio set is the answer. It includes a radio Receiver and 1 Transmitter (extra Transmitters available). *Note: on some models and some other brands of openers you may also need an adaptor.